A 45 minute assessment that tells you EXACTLY how often you should exercise, which level intensity you should do and how to utilize your individual Heart Rate Training Zones, both in and out of class. This personalized BLAST Blueprint will empower you to reach your goals. Your Anaerobic Threshold (AT) is the boundary line that defines your LOW intensity workouts and HIGH intensity workouts. Your VO₂ Max shows how fit your heart and lungs are. Your Resting Metabolic Rate (RMR), an additional assessment to the Metabolic Profile, shows how many calories you burn at rest. Your Profile results are then used to create the SECRET SAUCE (aka a formula of how many low intensity workouts and how many high intensity workouts you should complete each week in order to achieve your goals). Low Intensity – Your heart rate stays below your Anaerobic Threshold and your body is burning mostly fat as fuel to workout. Your heart rate should stay in the GREEN zone on the monitor in class while on the treadmills. On the floor, you’re picking up heavy weights to increase muscular strength and tone. High Intensity – Your heart rate stays above your Anaerobic Threshold and your body is burning mostly carbs as fuel to workout. Your heart rate should stay in the RED zone on the monitor in class while on the treadmills. On the floor, you’re picking up moderate weights and focusing on muscular endurance. 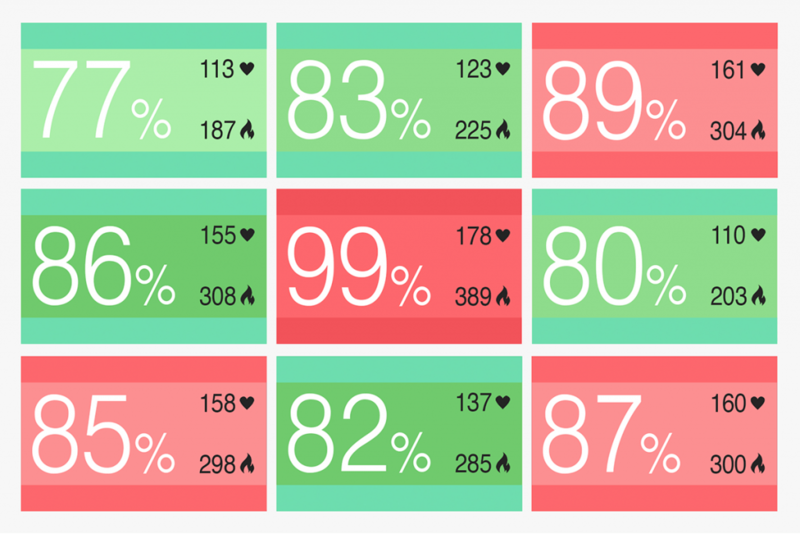 Our in-class monitors sync with your heart rate strap to show what zone you are working in and, depending on your goal that day, whether to go harder (and increase your heart beats per minute) or pull back (to catch your breath and slow your heart beats per minute). It also shows the amount of calories burned in real time. This ensures you never waste a minute of time during your workout. Very light training. Best for beginners and improves overall health. Light training. Best for active recover and improves basic endurance. Moderate training. Optimal zone for low intensity days. Best for burning fat. Hard training. Best for improving cardiovascular endurance on high intensity days. Very hard training. Best for improving VO2 Max on high intensity days.